Fiqh or legal maxims of Islamic law (Al-Qawaa’id Al-Fiqhiyyah) is a genre of Islamic sciences that focuses on general rules of fiqh which can be applied to a wide variety of particular situations. In fact, in Muslim countries a student cannot obtain a degree in Islamic sciences from an Islamic university without first having completed a course on this subject (Mohammed, 2005, p. 191). These maxims have been used by Muslim jurists for centuries to give verdicts. They assist in the matter of ijtihad because they organize the branches of fiqh and categorize cases and it is a must for every Muslim jurist to have knowledge of it (Elgariani, 2012, p. 380). This is why some scholars accurately depicted that “were it not for the law maxims, the fiqh rulings would have remained as scattered cases, outwardly discrete without any ideational connection between them” (Mohammed, 2005, p. 191). There are a number of definitions given for this genre but perhaps the most inclusive one states that it “is an all-inclusive rule based on legal evidence written accurately in comprehensive words, and it includes all or most particles, juz’iyat (cases pertaining to fiqh) which come under it” (Mishkah University, 2013, p. 3). They are often written in short but expressive statements. They tend to express at times the goals and objectives of the Shari’ah and this is why some scholars treat this subject under the category of maqasid (rules and objectives of Shari’ah) (Kamali, Qawa’id Al-Fiqh: The Legal Maxims of Islamic Law, p. 1). For example, one of the maxims states “hardship begets ease”. What it means is that in order for Shari’ah to guarantee itself relevance for all times and places, it never puts individuals in situations where the obligation becomes unbearable for them or makes their life difficult (Elgariani, 2012, pp. 238-239). This is why in Islamic law it is allowed for those traveling to shorten and combine their prayers, break their fast in Ramadan, and wipe over their socks for three days and nights. All of this is permitted to fulfill one of the objectives of Shari’ah to bring ease to the person because travel brings hardship, stress, and difficulty. Kamali expressed it perfectly when he said that these maxims “represent…the apex of cumulative progress” (Kamali, Qawa’id Al-Fiqh: The Legal Maxims of Islamic Law, p. 1) while others said that they “embrace secrets and the wisdom of the Shari’ah” (Mishkah University, 2013, p. 43) and assist in an appropriate understanding of the goals of the Shari’ah (Mohammed, 2005, p. 191). These maxims are usually extracted from the sources of Shari’ah, both primary (Qur’an, Sunnah, ijmaa, qiyaas) and secondary ones (methods of ijtihad: istislaah, istishaab, etc.) (Elgariani, 2012, p. 379). As for their wordings, they can be excerpts from the Qur’an or hadiths but in most cases “reflect the phraseology of leading jurists and have been refined with the passing of time” (Mohammed, 2005, pp. 193-194). Due to this modification over time, the final wordings of each individual maxim are difficult to trace back to the first individual who uttered it (Elgariani, 2012, p. 60). For example, the maxim “actions are judged by intention” is deduced from the famous hadith about intention in which the Prophet Muhammad (pbuh) said, “Actions are judged by their intentions”, which means that actions in Shari’ah are to be judged by the intentions of the doer behind the acts (Mohammed, 2005, pp. 199-200). So if a person commits murder, then his punishment in Shari’ah is decided based on the intention of the killer. If his intention was to kill the victim, then his punishment is different as opposed to the one who accidentally kills a person or did it in self-defense. The maxims are purposefully put in precise words in order to make them easy to remember and derive rulings without having to delve deeply into the texts. They are a sort of shortcut to same rulings that can be given and applied in many situations. For example, the maxim mentioned above about actions being judged by intentions can be applied to many circumstances related to worship, business transactions, and criminal law. Similarly, the maxim related to worldly things which states that “in general all things are permissible” can be applied to almost all situations of life. The scholars did an outstanding job of forming these maxims by doing a ”detailed study of several related rulings in order to extrapolate common factors that could be applied to similar matters” (Mohammed, 2005, p. 192). This is why some describe a maxim as “a general rule which applies to all of its related particulars…reflective of a consolidated reading of the fiqh” (Kamali, Qawa’id Al-Fiqh: The Legal Maxims of Islamic Law, p. 1). 1. 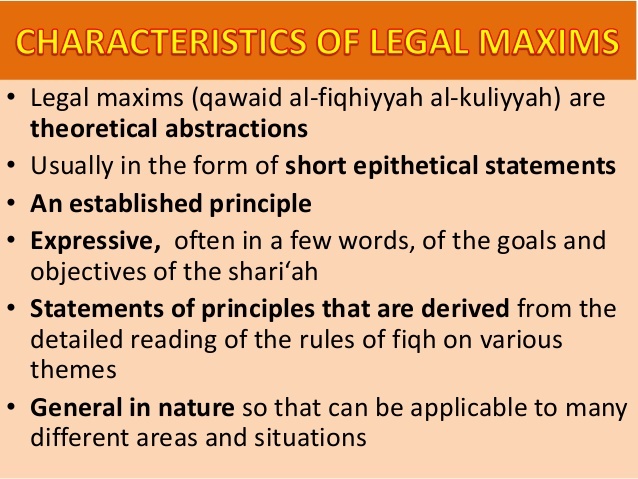 There is a category of fiqh maxims known as dawabit (controllers), which are restricted to a particular chapter or theme of fiqh and are not applied outside of it (Kamali, Legal Maxims and Other Genres of Literature in Islamic Jurisprudence, 2006, p. 82). For example, the fiqh maxim “when the water reaches two qullahs, it does not carry dirt” is restricted to the chapter of cleanliness and is not applied outside of it. Similarly, the maxim “all the dead animals are impure except fish and locusts” is applied only in issues related to eating and drinking and not outside of it. The maxims allow exceptions and particularizations and at times this is stated vividly within the maxim itself (Mohammed, 2005, p. 193). For example, the maxim mentioned earlier above that “in general all things are permissible”, the exception to this is “unless there is evidence to the contrary”.